The best wedding photos tell a story. And environmental wedding portraits showcase the environment as well as featuring the bride and groom in a location that conveys some insight into who the couple is. This couple are wedding photographers themselves (for our sister company Pink Palm Photo) and are all about travel and adventure! Like this photo illustrates, they are not afraid to venture into the unknown and always do so with a sense of fun. They took their bride and groom portrait session as an opportunity to 1) go hiking in a remote area and 2) practice their first dance moves! The four of us hiked for an hour to reach this rock formation at the base of a mountain in the remote area of Loreto, Mexico. Along the way, we looked for strong shapes and unique lighting to incorporate into a dramatic portrait. These giant boulders emphasized the wildness of the location. That combined with the movement in this image and its use of negative space makes it one of our favorite destination wedding portraits. Environmental wedding portraits are also a favorite of our couples as art for their homes. As one bride told us, "It would just feel obnoxious to have a closeup photo of myself blown up big to hang on the wall! But I love having our tiny couple on a big beach photo as a 20x30 canvas over the fireplace." 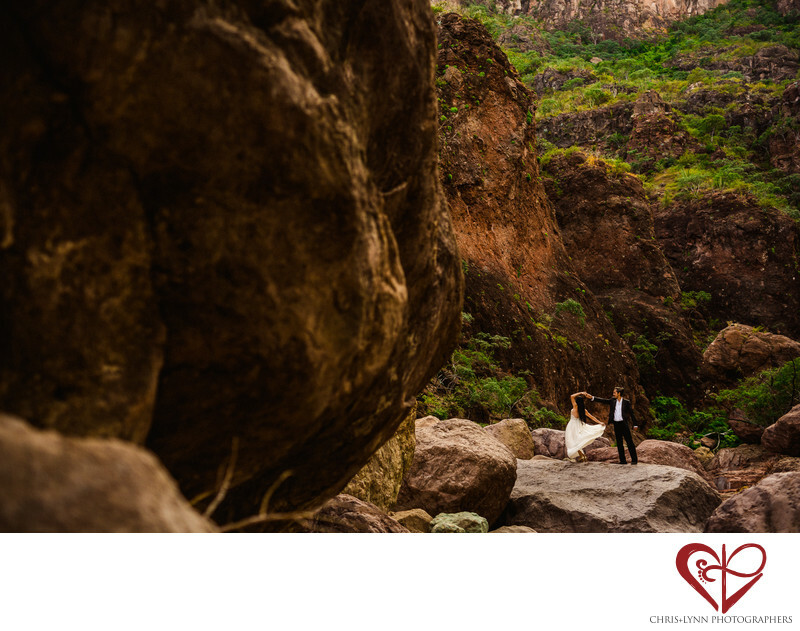 For Mexico destination weddings, we love to create a signature portrait that truly shows a sense of place. After all, you chose your wedding destination for a reason, and your wedding photos should showcase it! Whether your environmental portrait is on a white sand beach in Tulum, in a sunlit mango tree grove at Flora Farms, on a balcony overlooking the ocean at a private villa, or on the stairs of the chapel at the One and Only Palmilla, it is always a beautiful reminder of your wedding destination. 1/1250; f/2.0; ISO 100; 50.0 mm.